Dhoni gets off the mark when he tucks the returning Woakes off his hip for a couple down to fine leg. Yet again, India's skipper finds himself in the middle of a right old mess. The target for the tourists right now will be just to try and get through to the close with the game still alive, then hope the weather can help them out for the next two days. “@RPaulBucknall : @SkyCricket do you still think he's a part time spinner, @BumbleCricket ?”He is at Worcs .. It may be a desperate situation, but Dhoni isn't going to pass up the opportunity to cash in on some width. Woakes twice pays the price for dropping short outside off, India's skipper hammering him away for back-to-back boundaries in a rather expensive over from the normally miserly Warwickshire seamer. More runs for India - a mistake at mid-wicket lets Ashwin get two bonus runs, then he drives in convincing fashion through a huge gap at cover to pick up his first boundary of the innings. This pair also caused a few problems for England first time around, putting on a partnership worth 66 for the seventh wicket. Woakes expensive again - Dhoni takes him down the ground for four, not much wrong with the delivery but just a superb piece of timing as he duck it out from around his toes. The over also finishes with a boundary, India's skipper latching onto something dropped in short to pull away to the square leg rope. England just need to focus again after that flurry of wickets. India reach three figures - run-rate not a problem at all, just losing six wickets that happens to be a bit of an issue. They still trail by 115 and we have 29 overs scheduled for today's play. Woakes off after going for too many. Jordan takes over and only (ONLY) concedes five, all of them to Dhoni drives when he's far too full in length. Dhoni departs, and now England will really sense the chance to win tonight. 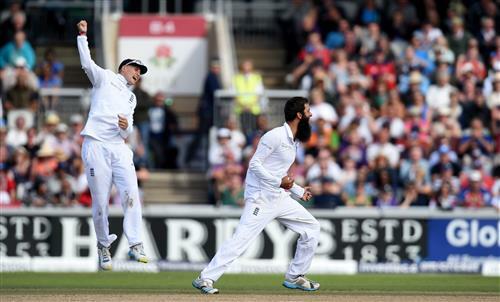 The India wicket-keeper came down the pitch to Moeen, then duly clipped the ball too close to Ballance at mid-wicket. Excellent catch, giving Moeen his fourth wicket of the innings. "That was a remarkable shot from Dhoni! I don't understand it with the weather likely to be awful tomorrow and rain against forecast on Monday. To go dancing down the wicket and get caught and midwicket is unacceptable." Kumar avoids a third straight duck in the series - and also registering a pair at Old Trafford - as he turns Moeen into the leg side for a long single. England are crowding the lower order with close catchers. “@teflonman123 : @BumbleCricket Shut up Bumble you unfunny ****.” You the bald one or the skinny one with your ...err 'chum' ? Well played England !! 3/1 now on the cards !! Well done the bowlers and let's hope M O Match Broady is ok !! Nasty blow..!! Groundsman, Matt Merchant ....was a terrific pitch that India struggled to cope with ...Oval will be slower pitch ..
“@teflonman123 : @BumbleCricket @deepdale62 I'd hate to come face to face with a 74 year old.” Ah, you again ..